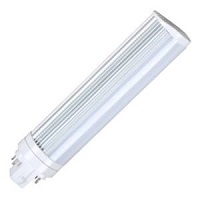 The 6- and 8-watt LED PL Lamps are available in GU24, E26 as well as GX23 and G24q pin base options to replace inefficient 13- and 18-watt compact fluorescents lamps (CFLs). The LED PL lamps ensure a long 50,000-hour lifetime, and deliver an 80 CRI with uniform consistency compared to CFLs. The lamps operate on a 120-277 volt system to easily retrofit into a variety of residential applications, including recessed cans, sconces, and ceiling fixtures.